Jarrod Mahon is Emerson Snowe. I spoke to him about his debut EP, Within My Dreams and the isolationist process involved in its creation. I get some of my best thinking done while I am alone, most of my best writing too. It’s more than just a matter of having less distractions; being alone forces you to rely on your own abilities without the benefit of easily consulting someone else. The end product is yours alone, regardless of quality. For any creative pursuit, this is pretty much the stock-standard approach. The thoughts and emotions that surface, especially if your work is self-reflective, are usually the most honest and personal; thus are important to the authenticity and validity of the end result. Music can be created as a group, but how much that song will resonate with those that wrote it differs – unless something affected a group of people in exactly the same way (not likely). The songs, artworks and written pieces made in bedrooms or places of solitude are countless, proving that, indeed, creative enlightenment is often best sought alone. From a slightly different standpoint, being alone and isolated can refer to the actual mindset of the creative; an emotional and social isolation that can be equal parts confining and freeing. It is one thing to lock yourself in a bedroom and write for a few hours only to leave it and be social, it is another to spend your time creating and then having nothing much else to focus on. The ‘island’ that many find themselves on often result in some astounding work. The work of Jarrod Mahon, who writes and performs under the pseudonym Emerson Snowe, is a result of such isolation. The now-18 year old relocated from Townsville to Brisbane last February to pursue studies in music. Most of 2012 Jarrod spent living alone, in a new city he was unaccustomed to. While he has found his feet socially and creatively in Brisbane, most of last year was a challenge, but it was also the time where a lot of his current material originated or at least evolved. I became acquainted with Jarrod through mutual friends late last year; we arranged to meet to discuss his EP, Within My Dreams once its February release date was set. His easy going manner and cool-dude aesthetic don’t do much to bolster the ‘serious and brooding’ mystique that I am propagating here; but once you listen to his music, you notice that there is a lot to take seriously. First, Jarrod has got serious talent. Second, he has got serious drive. Third, he is seriously only going to get better. I will describe his music as I felt it in a bit, but essentially it is a great mix of electronic ambience and skewed folk-pop balladry. Throw in some fragile, wraithlike emotionality and you are close, I think. The great thing about it is that you are listening to one guy when it sounds like it was created by four or five. There is a denseness to the sparseness that does my head in; but that’s cool. Before last year Jarrod was shaping up to be a prototypical singer-songwriter – so mind-bending composition is probably better. Perhaps it was a defensive tactic to switch the name up along with the style. If it doesn’t work then it’s not your own name being sullied. It has paid off so far though. It was during those 8-or-so months of secluded living that Jarrod forged the identity of Emerson Snowe. Thanks to the isolation in the wake of his move to Brisbane, the moodiness of his creation took hold of the song-writing and once combined with his sonic experimentation it wasn’t long before Jarrod had crafted a suitable vibe to go with the name. The stark contrast between Jarrod and the perceived personality of Emerson are so different that you’d think Jarrod spent that time making a replica of himself to house sad thoughts and memories. After moving to Brisbane to pursue music in the academic sense, Jarrod’s deferral of study might have indicated a loss of faith. The opposite is the case. While not having ‘grades’ to show for his effort, the process of creating Emerson Snowe may have taught Jarrod more than anything he could have learned in class. While 18 is an important year for formative adult experiences, Jarrod put himself through things that not many 18 year olds in Brisbane are accustomed to. At the end of 2012’s evolutionary process, Jarrod seems to have emerged more confident in his choice to pursue music as a career. It also gave Jarrod a chance to get some perspective and, dare I say it, some maturity. For his efforts Jarrod will soon have the EP, Within My Dreams; his first release under Emerson Snowe, encompassing his writing from before his move and his period of isolation. It was recorded in Melbourne with Maxwell Roberts from Velma Grove, who Jarrod connected with after some correspondence. Some parts of the EP were also recorded in Townsville. 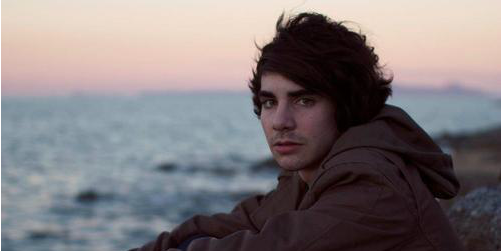 Emerson Snowe’s progression from acoustic composition to its current electronic –hybrid form came about during recording in Melbourne, where Jarrod had the opportunity to experiment further with new equipment. The programmed drum-sets and woozy ambience is still entirely Emerson, but the opportunity to try more things helped flesh out the songs that were perhaps unbalanced by the emotionality. Speaking of which, I probed Jarrod about what exactly Emerson Snowe writes about. For further clarification, Jarrod is no longer living by himself. He lives amongst new friends and is probably one of the more sociable guys in the Brisbane nightlife. His newest side project is Rumblegumz, a summery party-rock duo that he formed with Harrison Tang. Now that his circumstances have changed, what will Emerson Snowe’s next batch of songs sound like? He can still draw from the pile of demos on his computer, but what about creating new songs? Well, at the moment, things aren’t looking like they’ll come down, only rise higher. The past few months have seen the lead single from Within My Dreams, ‘Bella Rose’, earn praise around the blogosphere and even a written publication. AdamNotEve and Yen have taken an interest in Jarrod’s tunes, and people in Brisbane are starting to catch on as a consequence. There is still a long way to go, though. Within My Dreams will be out digitally and on Vinyl (with artwork done by Jesse Olsen) at the end of February, so there is some time to become acquainted with the demo’s on Emerson Snowe’s BandPage. As for what to expect? Well, I’ll leave that up to Jarrod to describe what he hopes listeners get out of it. I said before I was going to tell you how Emerson Snowe’s songs made me feel. Jarrod and I were in my car driving across the Story Bridge, he was playing me some samples from his EP. Stylistically my first thought was of The Antlers, but with a slightly rougher texture. Jarrod cites Conor Oberst and Dev Hines as artistic touchstones. Honestly, the music made me want to be alone. Not in a bad way, although the depressive tendencies of music like this do tend to favour that perspective. It made me want to be by myself, made me want to reminisce on things from the past. What a particular no-longer-friend is doing, things I could have done different when I was younger, re-evaluate where my life was heading and face repressed feelings of uncertainty and anxiety. Not everyone will feel this, I’m sure. The point is that songs formed in isolation have a peculiar effect on those who end up listening by chance. I can’t say if it was the lyrics or the music that clicked with me, but there is something special in the way Jarrod turns self-centric neurosis into something relatable. Perhaps that is a statement on our generation as a whole; I forgot to ask Jarrod about this, my bad. In the end though, his serious music is serious, but it has a fair share of magic in it too. Good on him for choosing to share it with us.